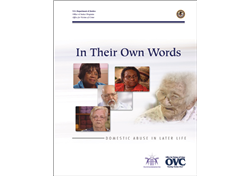 This 2 DVD set uses the voices of older victims to facilitate a dialog among a range of professions about the dynamics of abuse, the barriers these victims have to overcome to live free from abuse, and interventions and potential collaborations that may be effective in such cases. In addition to individual segments with victims, family members, victim service providers, and allied professionals, the DVDs include topical segments and a montage of victims and advocates speaking out that is designed for use by policymakers. It also includes an interactive role play between a parish nurse and an adult daughter caring for her father that is intended to help professionals recognize abusers’ justifications for elder mistreatment. The accompanying Training Guide provides background on the victims and discussion questions targeted at a variety of professional audiences. To request a copy of the training DVDs and Trainer’s Guide return to the home page description for the link http://www.ncjrs.gov/App/ShoppingCart/ShopCart.aspx?item=NCJ+227928 or copy and paste this link to your web browser. Visit the NCJRS website to obtain other materials from the Office for Victims of Crime, visit the NCJRS Publications/Products page. Search for all OVC products either by entering a product number or keyword in the search field at http://www.ncjrs.gov/app/publications/alphalist.aspx or copy and paste this link to your web browser.